It is not always feasible to collect and distribute files via emails or to download and upload files student-by-student, particularly if you have a large group of students. I use QMplus to accomplish this, my students downloads a template file, enters their answers to questions, and then uploads their answer file back to QMplus course MTH4105 – Introduction to Mathematical Computing (guest accessible). My assessments consist of Maple files; Maple is a bit like Microsoft Word plus sophisticated mathematical computation and display facilities. 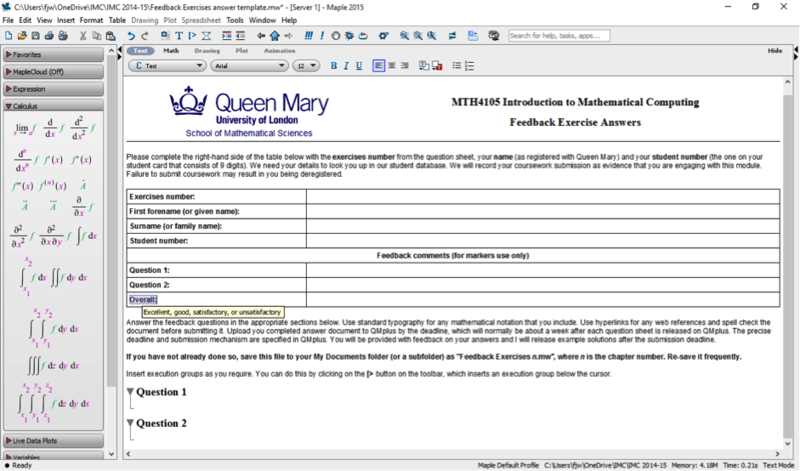 Each student downloads a template file from QMplus, opens it in Maple (see Figure 1), enters their answers to questions, and then uploads their answer file back to QMplus. I want to provide students with feedback on their answers to formative coursework exercises by returning annotated versions of their Maple documents. My markers find this easier than entering the feedback directly into QMplus. This is feasible only if there is an efficient way to do it, and preferably for the markers themselves to do it. 1. Log into QMplus and go to the module page. Go to the section for the current week and click on the ‘Assignment’ icon. Click on the ‘Download all submissions’ link towards the bottom of the SETTINGS menu, as shown in Figure 2. 2. This will download a zip archive file. Save the zip archive to your computer and extract the files. To mark each student’s submission, open it in Maple.Figure 3 shows an example of a marked submission (from one of the best students). 4. Log into QMplus and go to the module page. Go to the section for the current week and click on the ‘Assignment’ icon. Click on the View/grade all submissions button or the link towards the bottom of the SETTINGS menu. 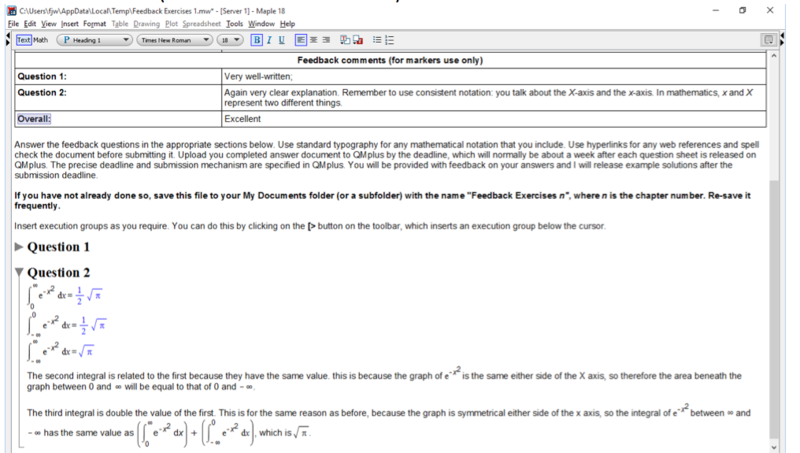 Expand the drop-down menu at the top of the page and select “Upload multiple feedback files in a zip”, as shown in Figure 4. 5. Upload your zip archive. (I use drag and drop, but you can also use the file selector.) Confirm the upload process as necessary. Check that you see all the feedback files in the list of students. That’s it! This approach seems to work well for everyone. With around 200 students, it is not feasible to use email to collect and distribute files or to download and upload files student-by-student.QMplus automatically assigns each file in the uploaded zip archive to the right student, who can then access it via the original assignment manager. 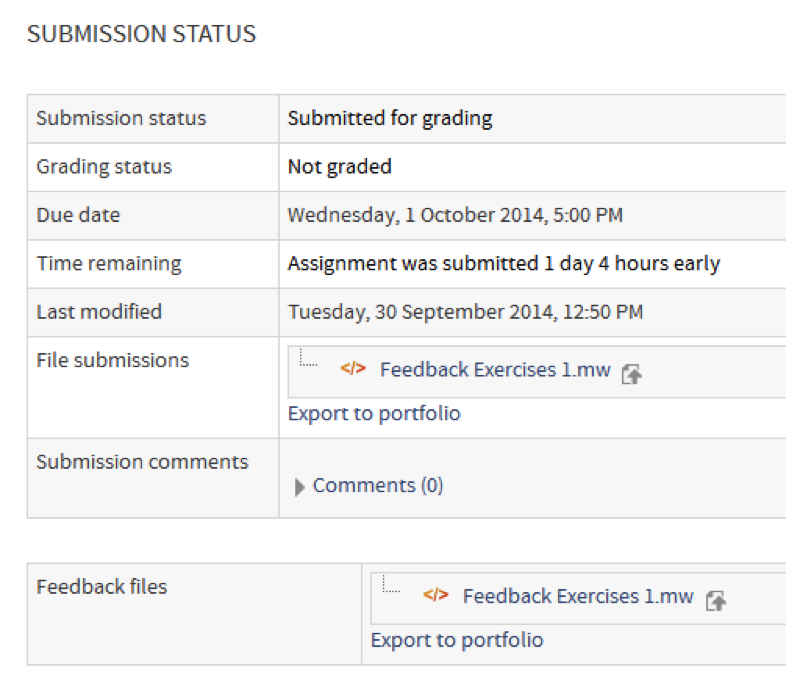 For example, after having uploaded the feedback files, the assignment manager provides access to both the student’s submission file and their feedback file, as illustrated for a typical student in Figure 5.